This 9mm Luger ammunition from CCI is a range staple ideal for high volume shooters that don't reload. 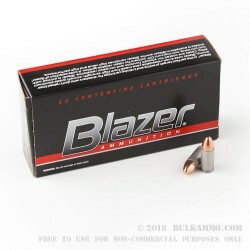 Each cartridge in this bulk priced case of 1,000 (20 boxes of 50 rounds each) fires a light 115 grain full metal jacket bullet at a muzzle velocity of 1,145 feet per second. This is a standard pressure load ideal for subcompact carry pistols or older firearms. CCI Blazer ammo is loaded in Lewiston, Idaho using non-reloadable aluminum cases coated for reliable cycling. CCI's Boxer primers are known for their reliable ignition so you won't be forced into involuntary failure drills. The Best value on the market today! I have put more than 500 rounds through my XD9 and not 1 problem! Even firing several mags very rapidly. Extremely accurate and by far the best ammo for your hard earned dollar!! For the cost I'll put up with the occasional jam that I had with all 3 guns I tried it in. First time to buy from Bulk Ammo. Service seems good. Arrived fast. Q: Where is this ammunition manufactured? A: Hello Robert, CCI ammunition is manufactured in the United States. The Blazer line of ammunition is made in their Lewiston, ID manufacturing facility. Q: What is the bullet jacket made of? Blazer's website didn't specify. A: Hello Robert, These 115gr. 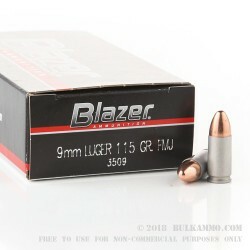 FMJ rounds by Blazer in 9mm have a copper jacket. 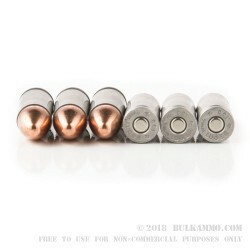 They are non-magnetic and are safe to shoot on ranges that do not allow magnetic rounds. These are great economical target rounds in 9mm. Q: Can this ammo be reloaded? A: No, the aluminum cases used in this ammo cannot be reloaded. Q: Is there a noticeable weight difference between aluminum and brass casings? A: Yes, the aluminum cases alone weigh about 1/2-1/3 of what a brass case would weigh. The bullet weight is still the same, though. Q: The manual for my KelTec Sub 2K says that I should use only brass cased ammo in it, and that other ammo may damage the firearm. What damage could be cused as a result of using other than brass casings? A: An examination of a Kel-Tec Sub 2000 manual did not seem to indicate that only brass cased ammo should be used. While it is possible that your manual is of a different version, the most likely explanation is that the firearm does not function well with steel cased ammo. No damage is likely to result from its use.